This letter was written by Halsey Amos Rhodes of Company H, 50th New York Engineers, to his sweetheart, Mary A. Fuller. Amos’ 1863 Civil War Diary is housed at the Special Collections Research Center at Syracuse University. Halsey A. Rhodes was born in Chemung County, New York, in 1836. The following year his parents, Silas B. and Mary L. (Babcock) Rhodes, relocated to Canton, locating on the present home place of Mr. Rhodes about 1839, where his father died in 1862 aged sixty three years, and his mother died aged seventy nine years. In 1862 Mr. Rhodes enlisted in the 50th New York Engineers, serving till the close of the war. After the war he married Mary A. Fuller, who died in 1891, aged forty eight years, leaving three children, Nelson F., Frank H., and Clara E. He afterwards married Sarah Bowman, born Grist, his present wife. The Engineer Brigade consisted of the 1st, 2nd, 15th & 50th Regiments N.Y. Engineers, and played an important role Grant’s plans for his Overland Campaign which commenced in May, 1864. Belle Plain Landing was Grant’s main supply base, where vessels brought in supplies and troops for the campaign. He also used Aquia Creek Landing, approx. 6 miles away, which the writer of this letter mentions as his rumored next destination. 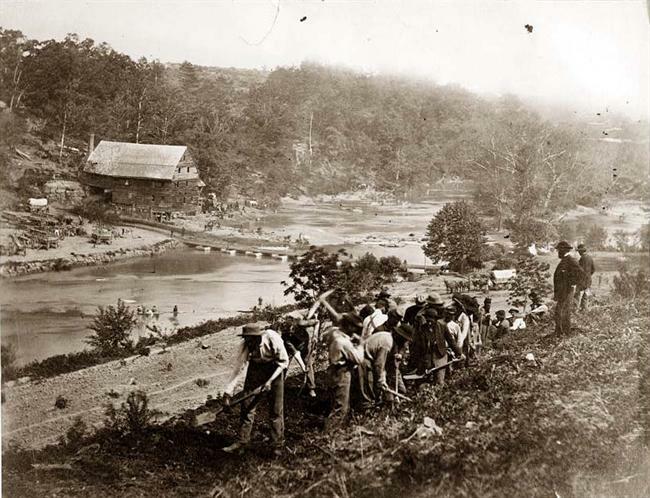 The men of the 50th New York Engineers were detailed as sappers, miners and pontooners. I have just received your letter the Fifteenth May and I take the first opportunity in replying. It has been wet since we left Washington for this place and there has been some talk of our going back there which will will suit me better than to remain here — it being a low place & very muddy. We are some ten miles from Fredericksburg. The 50th is there or a portion of it & some of it is at the front. I have not heard from H. Gordon since we left Washington, only by nothing official. Perhaps it will be well to mention that my writing desk is my knapsack. I am writing on ____. Did you receive a ten dollar note in your last letter? I put one in it and you did not mention of receiving the like and I make the inquiry of the receipt of that. Some letters are opened very nicely & the money taken out & then sealed up again before they get into the General P.O. at Washington. The mail to these Head Quarters does not come regular. I have some more money that I will send you as soon as we get located more permanently and mail gets a going regular. There are some indications of our moving from here soon to some place. I wish you would mention in your letters where you get notes so if mail matters prove uncertain, I will express to Corning in Kearney’s name. My time is limited and this letter is one of the short kind with but little sweet. Write soon again. So no more. This from your friend, — H. A. R.
There is rumor that we are going to Aqua Creek. I heard it talked of in camp just now. Commissaries are being loaded on the barges &c. in a jerk. This entry was posted on Wednesday, November 5th, 2014 at 4:17 pm	and posted in Uncategorized. You can follow any responses to this entry through the RSS 2.0 feed.